I have to confess that I’m a bit obsessed with stitch markers, mostly for use with crochet, but I don’t care if I use them or not, as long as they are stitch markers! I believe I heard about the WeeOnes stitch markers on the Lime ‘n Violet podcast and as soon as I had checked them out, I knew I had to have some. 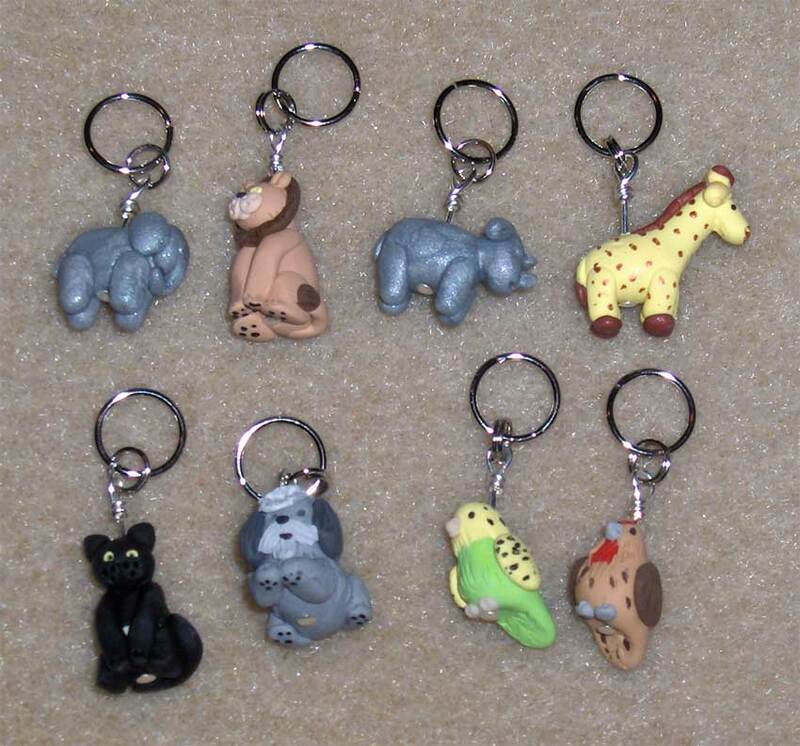 The stitch markers are made with polymer clay and come in a variety of designs: barnyard animals, cats, dogs, wildlife, food, and more. The sets include four or five stitch markers and may consist of one or more animal species. In addition, some of the sets may have the animals in different poses. For example, the Dalmation markers have each dog in a different pose: sitting, begging, lying down, and stretching. Each dog has a collar and handpainted pawpads. The attached rings fit up to a US 10 (6mm) needles, but you can request that lobster clasps be used instead, which is especially useful for crocheters. The pieces are approximately 18 mm in size and are lightweight so they won’t weigh your work down. My order from WeeOnes consisted of one Safari set, which included an elephant (which I collect), giraffe, rhino, and lion; and a special order set of my cat (Truffles), Shih Tzu (Kaylee), parakeet (CatBird), and finch (Rocky). Each marker was made specifically to match my “kids” from the tiny white spot on Truffles’ belly to Kaylee’s black rear and gray ears. Jillian made up draft versions of each marker for my review, made changes upon request and got my approval before finalizing each one. When I received them in the mail, I couldn’t have been happier with the results. I’ll definitely be purchasing additional WeeOnes stitch markers.